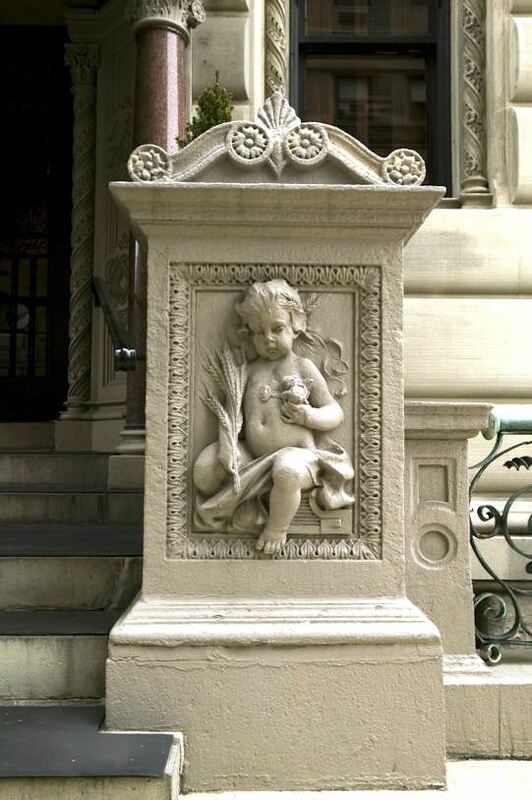 The house at 64th and Fifth Avenue, like its owner, did not fit the social mold. While other millionaires were hiring Richard Morris Hunt or Charles P. H. Gilbert to fashion chateaux and palazzos, Berwind commissioned the little-known architect Nathan Clark Mellen to design a red brick and limestone Edwardian Georgian townhouse. 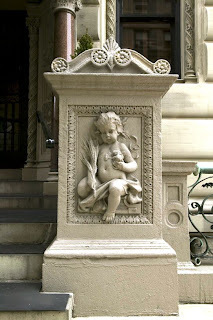 Although the entrance is decidedly on 64th Street, Berwind managed to retain the more prestigious 828 Fifth Avenue address. When his mansion was completed in 1896 Berwind was the largest holder of bituminous coal in the country and possibly in the world; the sole supplier of coal to the United States Navy and several railroads. The bowed Fifth Avenue façade, the two-story rusticated limestone base and the unusual arched entryway with its polished granite columns set the residence apart from its neighbors. A beautiful limestone “sidewalk moat” with scrolled bronze grills added to the architectural interest and prevented curious passersby from getting a too-close look inside. The interiors were decorated by the French firm of Jules Allard & Son. 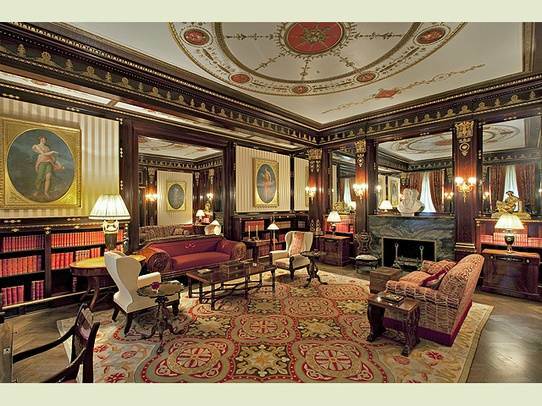 It was, as architectural historian John Tauranac has said “nothing less of a palace.” The first two floors held formal reception areas – the Berwinds’ private rooms being on the third floor. An opulent staircase swept up the central portion of the home, each landing serving as majestic foyers to the rooms on either side. The entire second floor had only two rooms: the Louis V-style ballroom and an oak paneled sitting room in the bowed area overlooking the park. A monumental fireplace supported by two muscular stone titans dominated the reception foyer. On the first floor were a library, dining room and a formal reception area. 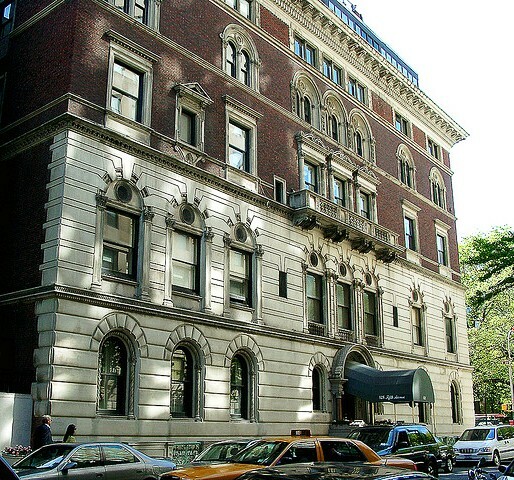 After his wife’s death, Berwind’s sister Julia moved into the house at 828 Fifth Avenue, acting as hostess there and at The Elms. The elderly Edward Berwind died in July 1942, leaving an estate of over $34 million. Julia Berwind remained in the mansion until 1945 when she sold it to the Institute of Aeronautical Sciences for around $300,000. Although the Institute preserved the rest of the interiors, they sadly removed the grand central staircase which once felt the sweep of beaded Edwardian ball gowns and the patent leather shoes of tuxedoed gentlemen. Subsequently it became the headquarters of the American Heart Association until 1978 when the mansion was reconverted to residential use -- at which time a modern glass penthouse was added to the roof. Edward and Sarah Berwind’s magnificent interior rooms were sympathetically and cautiously translated into two full-floor apartments (on the first and second floors), two smaller duplexes, and four other apartments in the former servants quarters. Scientist Joel Birnbaum lived in the 3,500 square-foot parlor floor apartment, with 18-foot ceilings and a vaulted foyer, from 1984 to 1999 before selling it for $9.5 million to real estate developer Howard Ronson. When Madonna looked over the first floor apartment, she reportedly laid on her back on the floor, staring at the painted ceiling for fifteen minutes. She chose not to take the apartment because there was no parking facility near enough to enter her home unseen. The second floor apartment includes a 4,000-bottle wine cellar and the Berwind’s elegant sitting room. 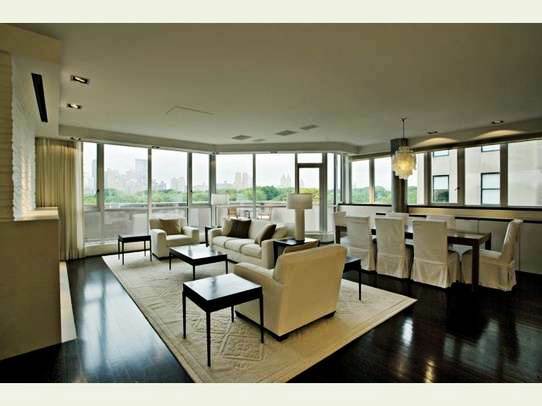 Among the residents who have lived here are entertainer Donna Summer and designer Adolfo. Apart from the apartment building-style entrance awning and the incongruous penthouse, No. 828 Fifth Avenue is in an amazing state of preservation and remains one of Upper Fifth Avenue’s premier architectural gems. Go here to see pics of interior today. Alexander Hamilton's 1802 "The Grange"
The 1843 Governor's Island "Admiral's House"
Judith Weller's "The Garment Worker"